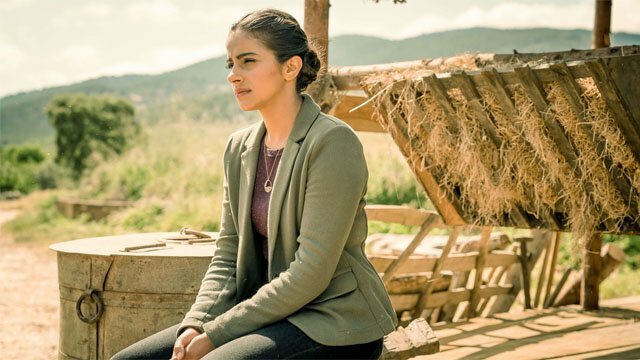 Doctor Who Season 11 Episode 6: "Demons of the Punjab"
After last week’s episode, Doctor Who season 11 episode 6 might feel slightly disjointed. “Demons of the Punjabi” is another historical episode focusing on character as opposed to story. In this case that serves the episode since much like Rosa it deals with specific historical events. The partition of India occurred in the 1940s and plays into the episode, tying the partition of India into Yaz’s history. The exploration of a central character as well as the historical nature of the episode make it a compelling watch as well. Throw in aliens and Doctor Who presents another emotional poignant episode of television for one of the show’s best seasons. The episode opens with a birthday between Yaz and her grandmother. Yaz is gifted a watch by her grandmother, which she uses to convince the Doctor to travel back to her grandmother’s past. The Doctor promises that they can have an hour, but when they arrive in India the Doctor has a vision of a mysterious entity, something malevolent and dangerous. After greeting a much younger version of her grandmother, Yaz discovers that she is engaged to be married to a man named Prem, who isn’t her grandfather. The Doctor teams up with Yaz’s grandmother’s fiancee to track the demons through the forest. While sharing his history in the war, the group stumbles upon an alien space ship that resembles the one from the Doctor’s visions. The doctor recognizes the ship, naming it a Vajarian hive. 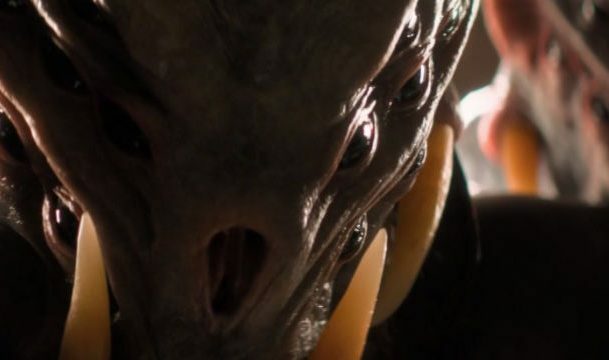 The Doctor shares that they’re the deadliest assassins in the galaxy and Prem reveals that he saw the Vajarians before and they were responsible for the death of his older brother. Yaz stays behind to share the death of the holy man with her ancestors. This leads the family to further believe that the wedding is cursed. 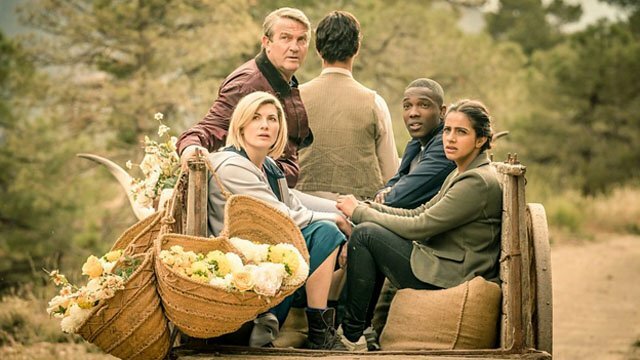 Yaz and Graham share a heart to heart as the group reunites and the Doctor confronts the Vajarian again, locking them out of the farm and trying to discern why they’re confronting this family. The Doctor learns that the Vajarian are no longer assassins and instead honor the dead and comfort those who die alone and they are here to witness the death of Prem. Later, the Doctor explains that the Vajarians are there to witness Prem’s death. In order for Yaz to be born Prem must die. The group goes ahead with the marriage with the Doctor presiding. Prem’s brother Manish rebukes the wedding. After being chased by the Doctor, reveals that he’s summoned a gang to take their land. Manish shares that he hates his brother and feels his wedding is wrong. Prem sends the Doctor away and confronts his brother. While the two discuss their history, the Doctor indicates that the group should leave. As they’re packing, Yaz points out Sheffield England on the map and her grandmother reveals that she was planning to go there. Once the various groups have fled the house, Prem confronts his brother Manish, the Vajarians appear and promise to honor his life as he’s shot by his brother’s gang. Back on board the Tardis Yaz asks if her grandmother lived. The Doctor points out that she did and that she survived. When the group returns to Sheffield she has a conversation with her grandmother. Yaz asks if she was happy and confesses her life was hard. The two share how much they love each other and acknowledge that without the struggles that they had endured they would have never found each other. 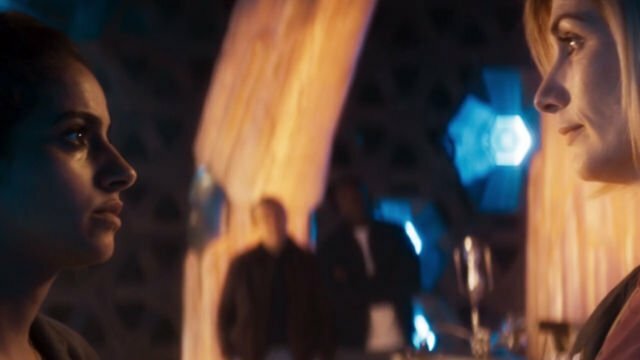 What did you think about Doctor Who Season 11 episode 6? Let us know in the comments below!